My name is Andy Urban. 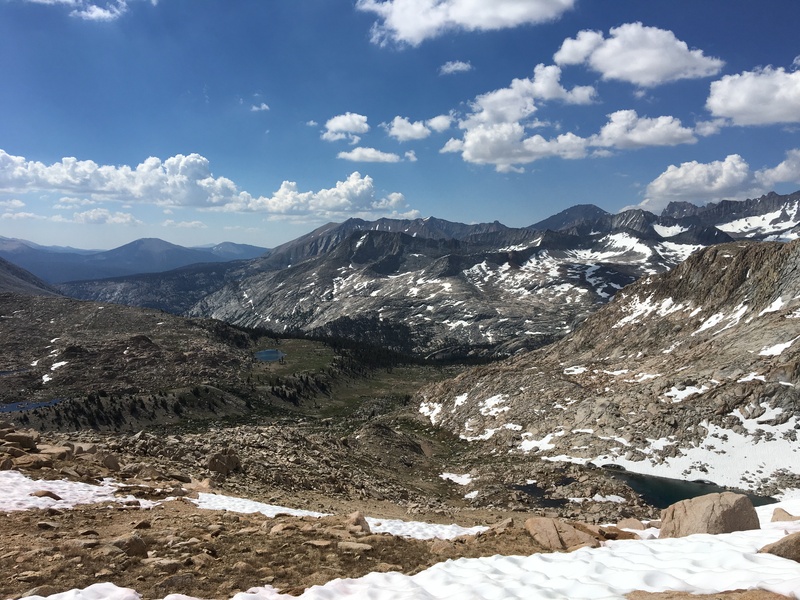 I use this site to share research and writing, exhibits, teaching materials, and other projects I’m involved in as a professor (along with the occasional hiking photo). Since 2012, I have been employed in the American Studies and History departments at Rutgers University, New Brunswick. As of December 2017, my book, Brokering Servitude: Migration and the Politics of Domestic Labor during the Long Nineteenth Century, is available from New York University Press (it can also be purchased on Amazon). Brokering Servitude examines how labor markets for domestic service were shaped and governed by philanthropists, missionaries, commercial offices, and the state, and how workers responded and adjusted to attempts to restrict their freedom of movement and contract during the period from 1850 to 1924. I received my PhD in History from the University of Minnesota, where I worked with Donna Gabaccia and Erika Lee. After Minnesota, I worked as a postdoctoral fellow with the Transforming Community Project at Emory University, where I researched, taught, and led public humanities projects exploring the institutional history of race relations at the school. In the fall 2014, a portion of the research that I conducted was published in the Journal of Asian American Studies. See here. 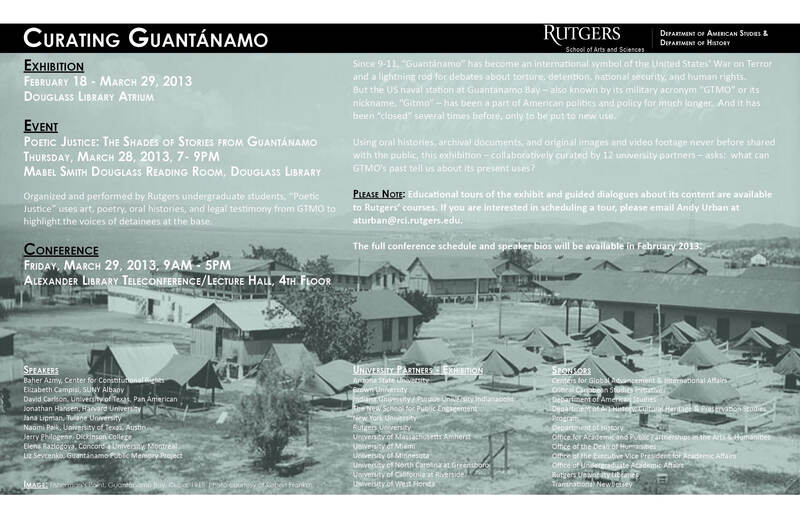 Poster promoting the Curating Guantanamo exhibition and conference at Rutgers, March 2013. Designed by Nicole Heater. Rutgers’ students also curated content for States of Incarceration, a collaborative project organized by the Humanities Action Lab (the successor to the GPMP). Students focused on the history of captive labor at Seabrook Farms, an agribusiness in southern New Jersey that specialized in frozen vegetables and employed up to 6,000 people during peak production periods in the late 1940s. This material can be seen on the States of Incarceration website and in person as part of the project’s travelling exhibition. The exhibit was on display at Rutgers in Douglass Library from January 22 to March 9, 2018, and was accompanied by a conference, tours, and other programming. I also worked with Rutgers’ undergraduate and graduate students on “Invisible Restraints,” an online exhibition that is currently hosted by the New Jersey Digital Highway. Seabrook Farms promotional flyer, distributed in internment camps, 1944. War Relocation Authority Records, National Archives, Philadelphia. Seabrook Farms has been at the center of a number of projects I am now currently working on.At Seabrook Farms, paroled Japanese American internees worked alongside Barbadian and Jamaican guestworkers, migrant laborers contracted from the American South, and a small contingent of German POWs, groups whose freedom of mobility and job choice were constrained. In 1946, Seabrook Farms also accepted Japanese Peruvians brought to the United States and imprisoned by the federal government and Japanese American detainees at Tule Lake stripped of their citizenship. In 1948, Seabrook Farms would add to its ranks of workers Estonian Displaced Persons, whom the company sponsored as refugees. 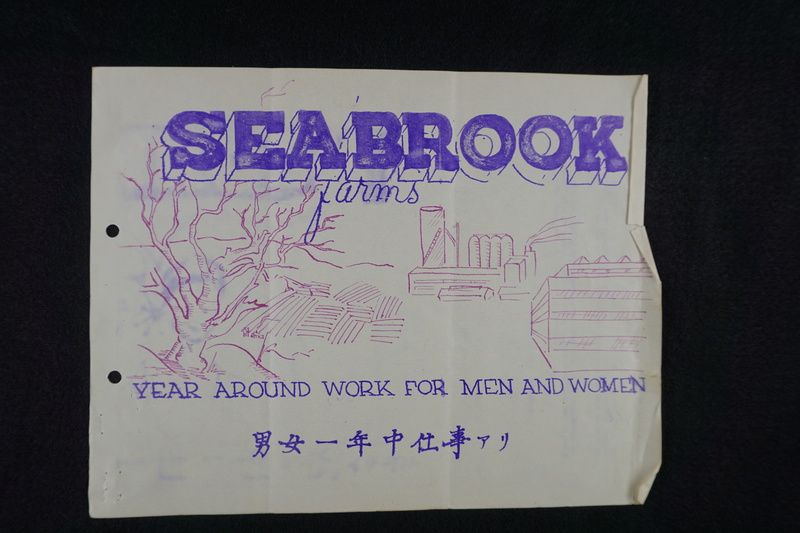 By looking at these different groups and their housing and treatment as workers, we have begun to explore how Seabrook Farms, as a company town, relied on various sources of labor that managers – often incorrectly – deemed controllable. During the summer of 2018, I directed The Company Town at Seabrook Farms, NJ: Internment, Migration, and Resettlement in the WWII Era, a two-week summer institute for K-12 teachers funded by the National Endowment for the Humanities. At the institute, Seabrook Farms was used as a case study of relocation during the World War II era, with teachers from around the country developing lesson plans and public projects looking at local histories of displacement, migration, and resettlement relevant to their students. 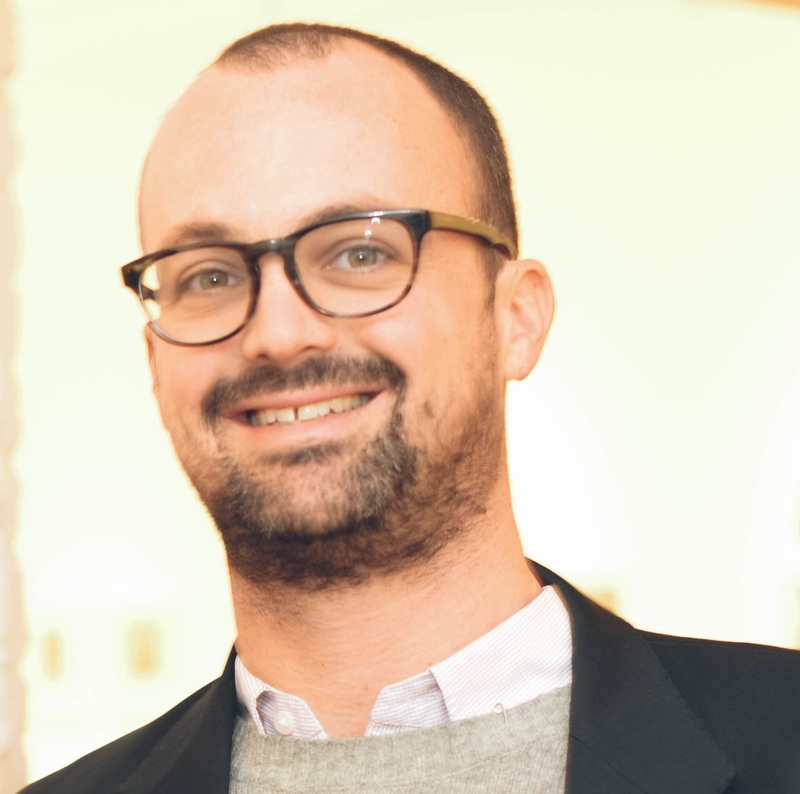 During the spring 2019, I will hold a Fulbright Fellowship in American Studies at the University of Klagenfurt in Austria, where I will work with students to document the history of Displaced Persons and refugees housed in camps in the province of Carinthia. This work will also explore how post-World War II refugee histories might be made part of Austrians’ public memory and used to inform community discussions of migration and refugee politics in Eastern and Central Europe – as well as in the United States – in the present. Peer-reviewed articles or article-length reviews that I have written have appeared in the Journal of Policy History, Gender and History, Journal of American History, Journal of American Ethnic History, Journal of Asian American Studies, nj.com, pri.org, Radical History Review, International Labor and Working-Class History, Journal of Urban History, and American Studies. When not working, I enjoy walking around Brooklyn and Manhattan. I’m known to have tricked unsuspecting friends into almost ridiculously long walks. I also like hiking. The smoke-filtered view from Cameron Pass. Olympic National Park, August 2018. Colby Pass, the High Sierra. In May 2016, I spent an amazing two months working as a Term VI Visiting Professor at Deep Springs College, in Inyo County, California.